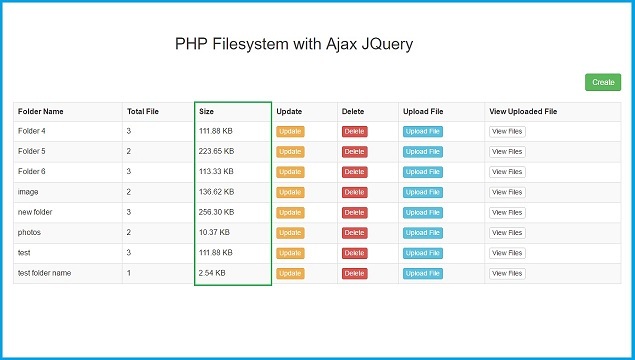 There are received many request on made tutorial on PHP Filesystem, so in this post we have discuss PHP Filesystem with Ajax JQuery. In this post we will discuss different function of PHP Filesystem function how can we used particular function as per our requirement. PHP Filesystem mainly deal with files or folder or directory. If you are looking for web tutorial on PHP filesystem then you have to follow this post in which we have used this function with Ajax Jquery. So we can perform all operation without refresh of web page. For discuss this tutorial we will first list all folder from directory by using PHP glob() function. By using this function we can get all list of files or folder now we want to get only directory then we have used array_filter(). So by using both function we can filter only folder from directory and display on web page. After this we want to create new folder dynamically, so we have use mkdir() PHP Filesystem function. By using this function we can create new folder in directory. After create new folder now we want to change folder name so we have use rename() function for change particular folder or directory name dynamically. Then after we want to upload file in particular folder, so we have use move_uploaded_file() function for upload files in particular folder. After uploading files in particular folder, now we want to list files from particular folder, show we have use scandir() function, by using this function we have list files from particular folder. After list files from particular folder now we want to remove files from folder or directory so we have use unlink() function. This function will remove files from particular folder. And lastly we want to remove folder or directory dynamically so we have use rmdir() function. By using this function we can remove folder or directory but this function will remove only blank folder or directory, so first we want to remove all files from folder, then we can use this folder or directory. Here we have not only use PHP script but also we have use Ajax JQuery and Bootstrap modal. We can do this all operation without refresh of web page. For front end we have use Ajax JQuery and Bootstrap modal, we have send request to server by using Ajax and it will send particular operation request to server and at server side we have use different PHP Filesystem function for do different operation like list folder or directory, create new folder or directory, rename particular folder or directory, upload files in folder or directory, list files from folder or directory, remove files from folder and delete or remove folder or directory. This all operation we can do without refresh of web page because we have use Ajax Jquery with PHP script. Below you can find complete source code and above you can get all video of this PHP filesystem video series. This Page is Really really good. thank you very much whoever did this. Information in this page was very helpful. great tutorial, how about subfolders?